Businessman and philanthropist Lloyd Dorfman has been fighting BP’s corner in the Evening Standard this week. He argued that the oil giant should be ‘applauded for its support for the arts’ and came out swinging against those who criticise it, calling us ‘profoundly misguided’. Whether Dorfman likes it or not, oil sponsorship is an ethical hot potato right now –and many in the culture sector feel that it is beyond the pale. This year both Tate and the Edinburgh International Festival parted company from BP following decades-long relationships, after coming under fire from artists and protestors. Leading theatres such as the Royal Court and the Arcola have publicly committed not to take fossil fuel funding. Actors and playwrights including Mark Rylance, Caryl Churchill, Emma Thompson, Simon McBurney and Miriam Margolyes have called for cultural institutions to sever their ties with Big Oil. When the Royal Shakespeare Company renewed its sponsorship deal with BP this summer, many theatre names were among the signatories to a protest letter published in the Times. Next year, the RSC is staging a new play as part of the also-BP-sponsored Hull City of Culture. The play? The Hypocrite. The irony is almost painful. Dorfman is rightly concerned about cuts in public funding for the arts, but wrong to promote BP as part of the solution. The problem, which he does not acknowledge, is that BP is not just any old company, and oil is not your average industry. As governments around the world ratify the Paris climate agreement it is clear that BP is on a collision course with humanity. Its plans to continue extracting and combusting ever more fossil fuels are in direct conflict with the rapid carbon emissions reductions needed to avoid climate breakdown within the next few decades. 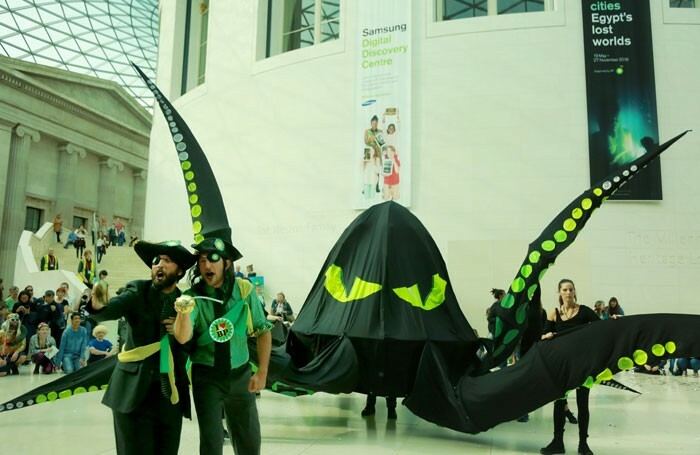 BP knows this, and is using its sponsorship of arts institutions to burnish its image, while quietly continuing its destructive mission to drill, pollute and lobby against effective climate action. Indeed, the company topped the list of firms obstructing climate legislation in Europe last year. BP is no neutral provider of energy, and cultural institutions that agree to bear its brand are helping perpetuate its dangerous power and influence. And then, of course, there’s the company’s responsibility for the world’s worst accidental oil spill in the Gulf of Mexico, which landed it with the biggest criminal fine in corporate history. Gulf Coast residents – still affected by the impacts of the spill – join numerous communities around the world that are resisting BP’s current and future operations as a matter of life or death. Dorfman suggests we should suppress any ethical qualms because BP is helping keep the arts afloat – even though the company has just cut its sponsorship contributions by a quarter. Overall, the Royal Shakespeare Company, British Museum, National Portrait Gallery and Royal Opera House (of which Dorfman happens to be a trustee) receive less than 1% of their income from BP. Early next year, BP’s sponsorship of Tate will come to an end after 26 years. Throughout that time, Tate members have consistently contributed more to the gallery’s budget than BP. In fact, for a long time Tate fought to keep the meagre size of BP’s payments secret, perhaps embarrassed by how much bang BP was getting for so few bucks. For what is pocket change to the oil giant, Tate Britain’s permanent collection was rebranded The BP Walk Through British Art, giving a shockingly skewed impression of who the gallery’s long-term supporters really are. BP is no philanthropist. It coolly hand-picks its cultural partners as strategic investments, choosing those that give it the most positive public profile, legitimacy and access to elite audiences at a time when the gathering storm of climate change means its future existence is under threat. Oil sponsorship does not exist in an ethical vacuum. It’s time to stop pretending that it does, and start defending the arts from the polluting influence of big oil.